When I was thinking of what to create for my post today, I remembered something I wanted to do when I created this project a month ago. 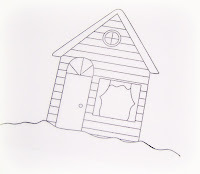 I wanted to create a luminary using this house image. When I was a little girl, I remember many Christmas Eves at my grandparent's house. My grandma had this church that used to sit on the mantle. It was a wind-up musical church. There was a light inside that glowed through the faux stained glass windows. It played Christmas carols like Silent Night and Away in a Manger and I spent many Christmas Eves winding it up and listening as I watched the glow through the windows and imagined a little village with little people. . .I had quite an imagination growing up! :) Anyway, when I created my little box last month, I knew I wanted to re-vamp it and create a luminary box! The first thing I did was cut all of the windows from the image using a craft knife. 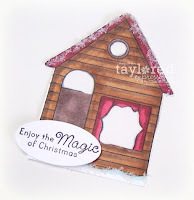 The next thing I did was stamp the house image from Holiday Wonder on a piece of vellum. I cut the window sections from the vellum. 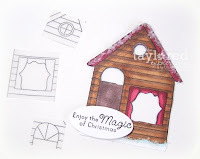 Then I adhered the vellum windows behind the cut out windows. I didn't have another of the tall gable favor boxes, so I opened up and traced the one I had onto brown cardstock. I cut off the top tabs so that the box would be flat on top. Before assembling the box I cut out the front portion that would be hidden behind the house image. I assembled the box and inserted my battery-operated tea light. I attached the house image to the front of the box and there you have it! 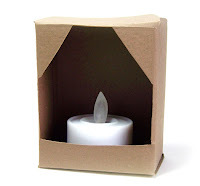 A cute little luminary that hopefully will give my girls lots of the special memories that I have! 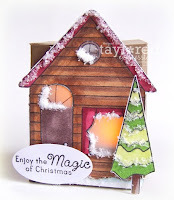 Can't you just imagine little Cuppie and family inside all toasty in front of the fire opening presents? LOL The tea light flickers, so it really does look like a fire is going inside! Hope you enjoyed my project and try one yourself! You, my sweet sweet friend, are ABSOLUTELY incredible! Seriously Charmaine...this is just STUNNING! What a treasure for your children, and it is SO flawlessly created!!! Beautiful! And such a sweet memory! Oh WOW Charmaine!!! This is the cleverest thing ever!!! LOL!!! Is that even a word??? LOVE how the light shines through the windows!!! This, hands down, has to be the cutest darned thing I've ever seen! I love it, and what a wonderful, clever idea. This a wonderful and creative project! I love it! 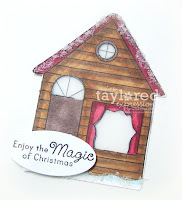 This sweet little house will bring so much joy to your family! I must make one! 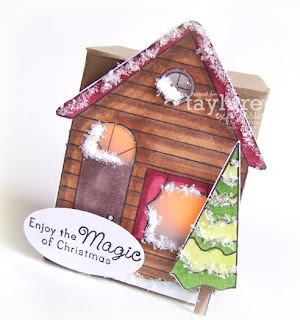 Charmaine, this is cutest little luminary box ever!! I love that it has special meaning to you too - how cool!! woweeee you must have great dreams to dream this up....it is deee"light"ful! creative, beautiful to look at and sweet as can be!!! oh, i can't forget original!!! just love it.